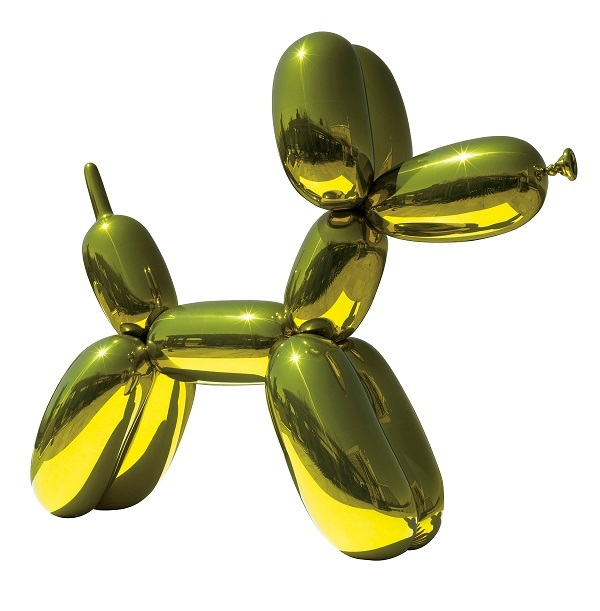 Jeff Koons, “Balloon Dog (Yellow),” 1994 – 2000. Mirror-polished stainless steel with transparent color coating; 121 x 143 x 45 in. (307.3 x 363.2 x 114.3 cm). Private collection. © Jeff Koons. Photo courtesy of the Whitney Museum of American Art. The Whitney Museum of American Art in New York City is in for a major transformation when it opens its doors to visitors in its new downtown facility in spring 2015, but before closing its gates to a lifetime of memories, it is going out with a bang at the present uptown Breuer building location. For the first time in his three-decade career, artist Jeff Koons can proudly say that he has reached a monumental achievement that will go down in the art history pages: a comprehensive retrospective of his creations in the Empire City. Though no stranger to Koons’ works (having participated in their 1989 Biennial and exhibited there since the early 1980s), it is the first time that the museum has dedicated nearly all of its floors, inclusive of the outdoor sculpture court, to a single artist. The entire collection, made up of approximately 120 works, includes sculptures like his infamous Balloon Dog (1994-2000) and Michael Jackson and Bubbles (1988) as well as his lithograph billboards like Made in Heaven. Walking from corridor to corridor, one will find pieces from each stage of his talented journey. However, not everything in this exhibit is dated. In fact, the crème de la crème of this showcase is his newest addition, one which was 20 years in the making (talk about devotion to one’s craft). Needless to say, there is quite a history behind this epic work, from the material used to the costs involved. Titled Play-Doh, the model is a gigantic multicolored sculpture with a hyper-realistic surface that will resonate with anyone that not only played with the molding compound as a child, but understands the thrill, symbiosis and personal experiences that a single piece can invoke. In fact, in an interview with the New York Times, Koons said that he hopes that when people view the work, “they feel just their own potential; they feel the excitement of their own interests in life, and just pursue them.” And, of course, the riveting fun doesn’t end there. There’s the playful painting Sandwiches, with its bulging smiley faces made out of pickles, lettuce, mustard and olives; there’s Elephant, one of his many mirror-finish sculptures; and, naturally, the indelibly iconic Popeye. But we won’t reveal all that awaits you upon entrance. You’ll simply have to see it for yourself. Jeff Koons, “Made in Heaven,”1989. Lithograph on paper on canvas; 125 x 272 in. (317.5 x 690.9 cm). ARTIST ROOMS Tate and the National Galleries of Scotland. Acquired jointly through The d’Offay Donation with assistance from the National Heritage Memorial Fund and Art Fund 2008. ©Jeff Koons. Photo courtesy of the Whitney Museum of American Art. 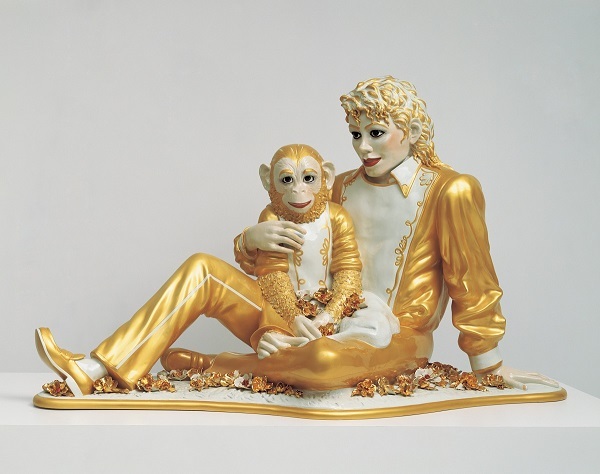 Jeff Koons, “Michael Jackson and Bubbles,” 1988. Porcelain; 42 x 70 1⁄2 x 32 1⁄2 in. (106.7 x 179.1 x 82.6 cm). Private collection. © Jeff Koons. Photo courtesy of the Whitney Museum of American Art. For those unfamiliar with his work, some might find it a tad bit trite or even something that is devoid of true artistic integrity, perchance aimed at the present-day fashionable rich folk. But whether you love or hate his handiwork, or think that it is representative of materialism in today’s art world, what Koons manages to do with his designs is shine a fluorescent, “hard light on the culture in which we live and art’s place within that culture.” Yes, his art might be seen as superficial and kitschy; however, that is its purpose: to critique the consumeristic times we live in. “The incredible range of his materials, subjects, scales, formal approaches, and techniques is virtually unparalleled and will make for a dramatic narrative full of plot twists and discoveries. It’s hard to think of another living artist who has pushed as many aesthetic and cultural limits as Koons has,” he adds. If you reside in the Big Apple, or are perhaps planning a visit this summer or early fall, we urge you to see this exhibit — if not for the contradictory remarks that abound in Koons’ riddling and knowledgeable contemporary art, then to bid goodbye to the halls that linger with the ghosts of artworks past. We promise that, at the very least, you will be touched. 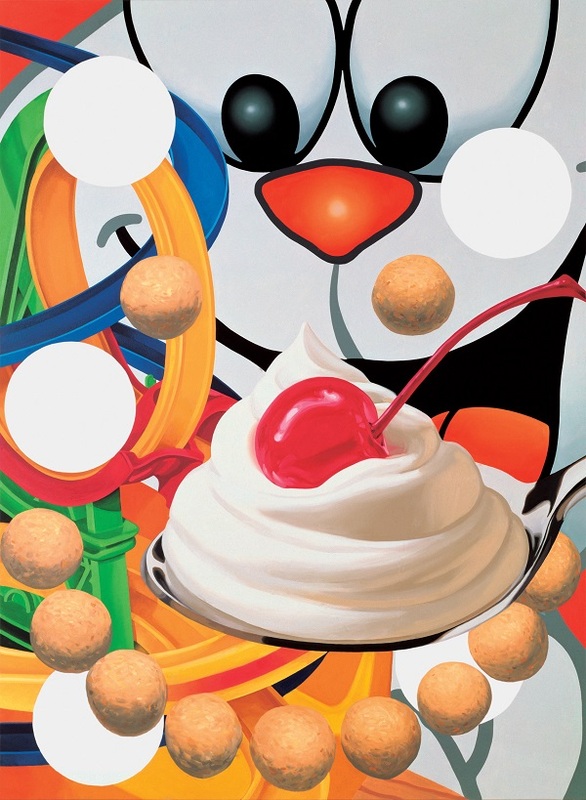 Jeff Koons, “Loopy,” 1999. Oil on canvas; 108 x 79 1⁄4 in. (274.3 x 200.7 cm). Bill Bell Collection. © Jeff Koons. Photo courtesy of the Whitney Museum of American Art. 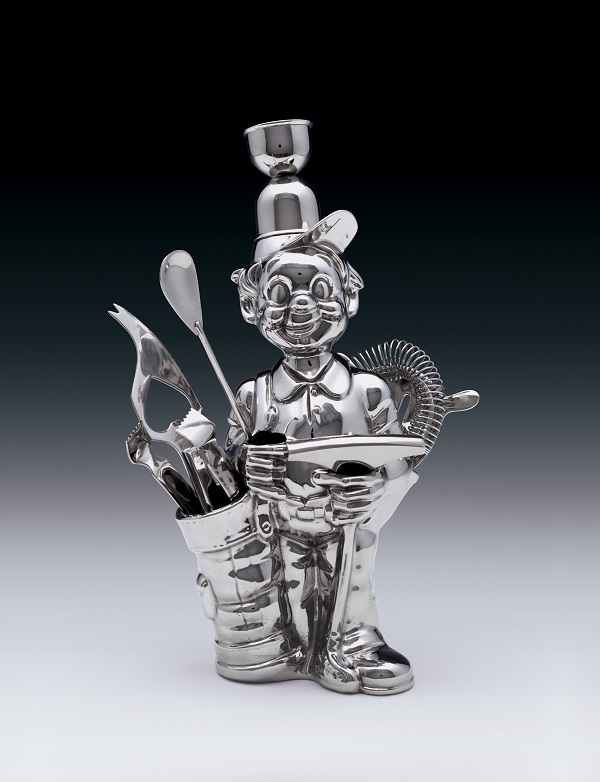 Jeff Koons, “Fisherman Golfer,” 1986. Stainless steel; 12 x 8 x 5 in. (30.5 x 20.3 x 12.7 cm). Edition no. 3/3. Julie and Edward J. Minskoff, © Jeff Koons. Photo courtesy of the Whitney Museum of American Art. Jeff Koons, “New Hoover Celebrity III’s,” 1980. 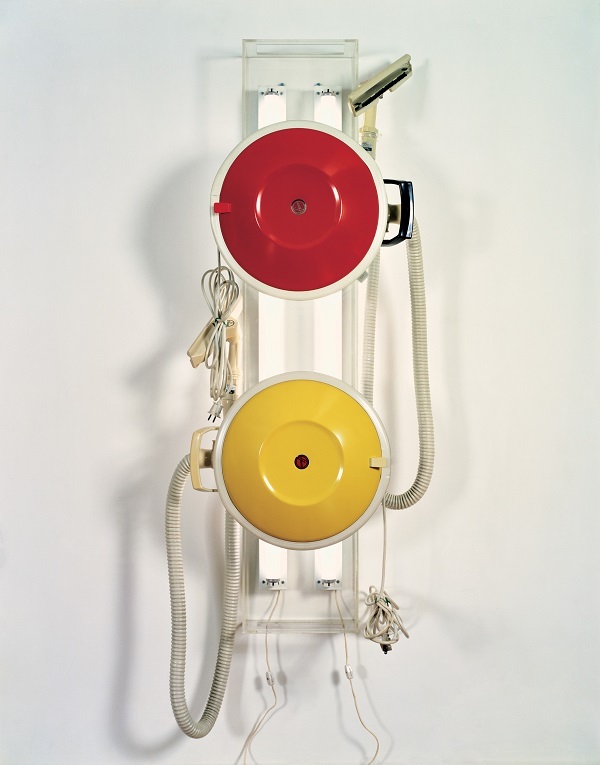 Two vacuum cleaners, Plexigas, fluorescent lights; 56 x 11 x 12 1/2 in. (142.2 x 27.9 x 31.8 cm). Collection of Jeffrey Deitch. ©Jeff Koons. Photo courtesy of the Whitney Museum of American Art. “Jeff Koons: A Retrospective” will remain on view at the Whitney through October 19, 2014, after which it will travel to the Centre Pompidou in Paris (November 26, 2014 to April 27, 2015) and the Guggenheim Museum Bilbao in summer 2015. For more information about the exhibit or the Whitney Museum, inclusive of exhibition hours, please click here. For more information about Koons himself, you can visit Artsy.